This is a A curious case of over enthusiastic advertisement. Please be advised that DGCA may arrest you if you drive the new fluidic verna without a pilot license. This is because of Hyundai’s own admission in 2009 while campaigning for Verna that if it gets any better, one would need aviation license. Ever since the Hyundai launched fluidic Verna I was searching for an image of their previous print advertisement- which used to be all around the newspapers during 2009. Finally managed to get a snapshot of this print ad and hence this post. 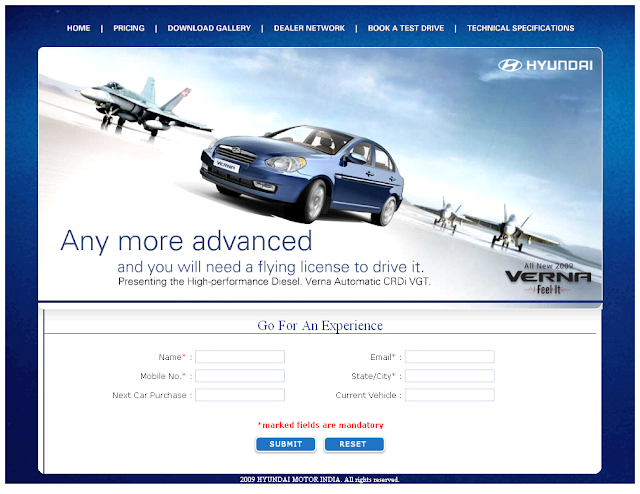 Have a look at the image below, which used to be Hyundai’s Ad for the ALL NEW VERNA during 2009. So way back in 2009 Hyundai admitted that it is the best the car can get and if it gets any better, it will be like an airplane and customers will need Pilot license. Now that a better version of Verna is on road, it is time to apply above rule. Hyundai should either admit that they lied to everyone way back in 2009 or accept that Fluidic Verna shouldn't be driven without pilot license. Ok. By now you would have decided that I am stupid. I shouldn’t take a print ad literally. But my point is this. Advertisers use all gimmicks to lure customers as if there’s no tomorrow and it is now or never. Have you ever seen any ad which says, “Don’t buy our product now, buy later”?. Don't get fooled by what manufacturers say. Research online and take your own informed decision. There's always a better version planned for future and deals and discount will be there in future also, as manufacturers won't plan to shut shop after selling their "Latest" products to you. looks like a powerful small car. Interesting review. Very true, consumers are taken for a ride when it comes to selling a product. The way things are presented going out of the way of reality. My chin throws a dimple whenever I watch those axe affect ads and latest five stars ad where one forgets self at the bite of choc. It wasn't a review of the car!